Today’s quote comes from Sir Winston Churchill, former British Prime Minister (1940 to 1945, and 1951 to 1955), prolific author, winner of the Nobel Prize for Literature (1953), and one of the greatest orators of the 20th century. 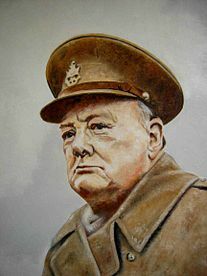 The frequency of the encounter – Churchill suggests that we encounter truth only occasionally. Our unawareness of the encounter – Churchill suggests that we often don’t recognize truth when we see it. Perhaps it’s not that truth is so elusive, but that we spend little energy in seeking Truth. It’s hard to believe that November has flown by so quickly and the holidays are already upon us. Of course, the fast-approaching end of the month also means that the next First Friday Book Synopsis is just around the corner. Next week, to be precise — on December 7. If you are in the Dallas area, I encourage you to join me for this unique event. For just $22, you get a hearty all-you-can-eat breakfast, networking with area business leaders and MBA students, a printed outline and summary of the books, and a chance to win one of the books. Oh… and you also get to hear Randy and Karl present their summaries of the books. One thing I’ve learned in life is that I am not designed to work alone. Two people working together can accomplish far more than those two people working independently. This is one of those truths that almost everybody readily acknowledges, yet quickly forgets. There lurks within me a streak of independence that loathes to ask for help, so I often end up spending too much time on a project, doing sloppy work on the project, or not completing the project. Trying to do everything myself not only robs me, but it also had a negative affect on those around me. My stress increases, so I have less patience for those around me. Other people have to work on or complete projects that I might otherwise be able to work on. I’m not transferring skills to others. I’m not building relationships with others. Yes, these seem like obvious points, but perhaps I needed a little reminder, courtesy of Andrew Carnegie. 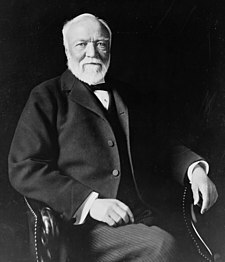 Carnegie founded and built Carnegie Steel Company (later US Steel) into one of the world’s largest companies, and in the process became one of the world’s wealthiest men. He was born 172 years ago today.